Today I’ve decided to do something fun by giving you a Literary Listening list, which includes podcasts, steaming radio, and YouTube. If you’re a book lover like I am, but also someone who enjoys book talk like I do, then these programs might be worth checking out. I think I discovered this podcast waaaay back when only a couple of episodes were released. I promptly forgot about it and am quite surprised that I didn’t discover it again earlier. I’ve listened to couple of episodes this week and I really like the content. It’s informative, informal, and the host’s voice is soothing. It looks like the podcast covers individual books, authors’ oeuvres, and short stories with a smattering of interviews and other topics of literary interest. This PBS produced show features Lindsay Ellis, a YouTube-famous video essayist. On her own channel she covers mostly the big screen. But in It’s Lit, she talks books. These videos are binge-worthy short, and you can probably spend an easy evening watching them all. The animation is good if a little dorky, and the same can be said of the topics Ellis covers. Hosted by Michael Silverblatt, this KCRW produced radio program is all about the author. Featuring interviews with authors for over the last two decades, this show is a treasure trove of the talented and the famous. If you’re interested in hearing one of the most well-read interviewers speak with great novelists, poets, and even some of our great essayists, then this show is a must for you. Mattia Ravasi loves to talk about books. On his YouTube channel you’ll find book reviews, a deep read of Gravity’s Rainbow, and more. I like to watch his channel both to discover new books and to see what he has to share about my favorite classics. His videos are a bit rough around the edges, but I still encourage you to give him a try. He’s bound to improve over time, especially if we support him. And we all want our literary booktubers to improve, grow, and thrive. What I really like about him is that he often loves the books and authors I don’t, and vice verse. And yet I still find what he has to say compelling. Another YouTuber who loves to discourse about books. Ryan talks about great writing and great authors. I especially like when he does close readings of short fiction. He’ll provide a link to the story so you can read it before finishing his video. More recently he has been doing a reading challenge and livestreams. You can see Ryan’s passion for literature on his face when he’s talking about his favorite authors. Like most amazing book nerds on YouTube, he could use more support. So, for the love of Ryan, check him out. Hosted by Sarah Rhea Werner, this podcast is all about the the writing process and the author. Broken into two types of shows—interviews and monologues—you’ll easily find an interesting episode. I personally love her monologues. Hearing Sarah give advice and reflection on the writing life gives me a boost when my inner-muse is feeling lethargic. The Coffee Break episodes feature authors Sarah has interviewed. You can even find an interview with me somewhere in the archives. Out of all the shows on my list, I’d say Write Now is the most open to all types of readers and authors. Hosted from the campus of Stanford University’s KZSU radio station, this program is all about life and literature. Entitled Opinions may have a pretentious name, but the expertise of the host and those he interviews give the title another meaning, one that speaks to a lives lived in pursuit of knowledge and deep learning. Not all shows could get away with a name like Entitled Opinions, but this one most certainly can. The show revolves mostly around literature, philosophy, and art with occasional forays into science, politics, and other topics that anyone interested in the world them will also enjoy. This podcast was recommended to me in my Literary Fiction Writers group on Facebook by a friend of the podcaster. The first season is pretty bare bones, but it picks up quickly from there. Interviews, literary readings, and literary ramblings are in store on this show about books and life. Episodes are currently listed at the bottom of the home page. This seminar-related podcast was founded in 2018. Sadly, it only has four episodes, but I kind of love it. It’s generally a Q&A format covering a range of contemporary literary topics. It’s student-led, having different interviewers running each episode. This might be why there’s not too many of them up yet (no one particular host whose vision runs the thing). So take a listen and maybe even contact Melanie Micir at mmicir@wustl.edu to ask about upcoming episodes. This YouTube channel is an amazing source of writing advice. If you’ve ever wanted to know about the how in writing fiction, this is a great resource. From plotting to editing, from developing characters to incorporating flashback, this channel has some practical advice for all writers. Now there are probably tons of great writing channels out there on YouTube, but I’ve gravitated to this one because she’s so often focused on aspects of the writing process I either don’t think consciously about or don’t use at all; I find it intriguing, plus it gets me examining what I typically do by instinct. You’ll also find a good mix of recent reads and writing vlogs on this channel, so you’ll not only get advice but also get to know Shaelin along with receiving some great book recommendations. I do have a list of about 9 other podcasts and programs I want to check out. As I listen to these and make my assessments, I’ll add them here if I like them. If you have any recommendations, please do share them in the comments. I promise I will give them a gander. Remember, if you can’t feed your brain books, book talk is a great alternative. Goodnight and happy listening. This week’s dialogue for my 2018 writing challenge is The Nihilist and the Strangler. This creative conversation explores the fundamental meaning or lack thereof of life and the ever after. Nihilism sort of brings up the absurdity of working for money, an abstract and transitory thing, when you’re going to die someday, having worked a good majority of your own finite existence here on earth for $$$ instead of actually living a meaningful life. Well, I’ve been living, just without free weekends, for almost three years now. I feel like I played the system. I wasn’t free, really; I just found a way to make time and money work for me. But the system is harder to escape for the working class artist like myself than it is for those who run the system at the top. This is especially true when you have crippling student loans like my wife and I do. Other things compounded and caught up to us (things like a new A/C and new tires for the car) and here we are with me picking up a second job just to keep us afloat. I don’t plan to hold two jobs permanently. At least not two non-writing-related jobs. And like I said in my last post, I’ll be using my precious free time wisely to finish my novel. Like any millennial worth their salt, I value the quality of life. So two dead end jobs aren’t a permanent solution. But that doesn’t mean I’m not willing to work to get to where I want to be. And work hard I will at the hotel, at the gas station, and at my writing. Today’s post is both to announce the title of this week’s dialogue for my weekly dialogue-only writing challenge and also to make an announcement. First the dialogue. . . . The dialogue-only story for today is a bit of a meta piece wherein two characters are discussing the author: me. I hope it’s clear from the artwork exactly where this story is going. Truth be told, this is the only piece I’m worried about getting into the book. It feels to me like it might be an even more problematic piece than Insults Two by Two. It’s not so much the content for About the author: but how I want to use the story in the book, which is something I also feel is terribly obvious. Well, despite my worries, I’m still putting this one down as my next dialogue. It may be meta, but it’s a fictional story through and through. Now, a little bit about me, the author. 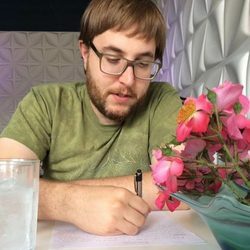 As some of you may know, I have been writing full time for a about three years now. I work weekends at a hotel. Every Saturday and every Sunday I come into work at 3am and leave at 11pm. That’s sixteen hours a day, back to back. In other words, I’m putting in a thirty-two full time job hours in two days. This doesn’t cover my bills. I’ve been okay for 2.5 years, but with my wife’s student loans recently coming due, an unexpected increase in monthly repayment for both of our loans, and the loss of rent from two roommates, it’s become tough. So instead of wasting my time building a platform for Patreon, I went and got a job. I will admit, I did see this coming. I actually started working a sales position with an online company but didn’t make any sales in two months. I liked it since I set my own hours and worked from home. I liked that it was incoming calls. I liked everything, except for the fact that nobody wanted to buy what I was selling, even if it would help their own businesses. Beings I only got paid on commission, that job got kicked to the curb early last month. After applying all over the place and having to turn down positions that would require weekends (and not pay enough to make up the difference of losing my hotel income) I have landed a job at a travel center. You know, one of those gas stations that serve as a home away from home for truck drivers. Truck drivers are a huge part of my life. Father, grandfather. Great grandfathers. A huge portion of the hotel’s clientele. So, yeah, this will be my job four days of the week. It won’t necessarily cut into my writing time, which I tend to do in the morning. But it will cut into my family life (my social life is pretty insubstantial). I don’t really like my family time being cut into (don’t like it at all in fact), but I can use that to my advantage. What advantage? Well, for one, the constraints of a second job will certainly eliminate the illusion of boundless amounts of time. I believe a second job will force me to set a ridged schedule. Right now my writing schedule looks like this: WAKE UP —> EAT—> READ —> WRITE UNLESS IT’S TOO NICE OUTSIDE, THEN JUST KEEP READING OUTSIDE —> LUNCH —> SHOWER —> HANG WITH THE WIFE, etc. As you can see, my writing schedule has recently been more like a loose suggestion than a rigorous routine. I function better as a routine guy. I used to go to a cafe and write daily. Then I became poor and my routine was gradually broken. Now that I won’t have the luxury of five full days of unstructured time, I’ll have to treat my writing more like a job. Or a passion. Because, hell, it is my passion. I can blame my love of books, stress, the online sales position, or sunny weather on not putting my writing first, but really when it comes down to it, the reason is me. I know I need structure and scheduling. I am more productive with it than without it. That’s why I went to the coffee shop even though there were far more distractions there than at my house—the coffee shop gave me a routine. In the end, even though I’ll be losing time doing the things I love for the cash I need, I know that this will actually make my writing output increase quite a bit. I’ll admit that I’m going to miss all the relaxation, romance, and routine I’ve built around evenings with my wife. The truth is, we don’t know if we’ll be able to emotionally handle it once the school year starts since she teaches from 7am to 3pm and I’ll be working 3pm to 11pm. She already loses me all weekend to my job at the hotel. But we do need the money, and this will help me cement a daily writing routine. Yeah, I’m being a glass half-full kind of guy. But I think working six days a week will motivate me to write better and write more so I don’t have to hold a day job. Though I’d rather hold a job and write than not need a job but be pen and paperless. If anything, I think this summer of too much free time has taught me to stick with a schedule—a rigid one, even if it’s totally artificial. Thanks for reading, bookworms. Leave a like or comment and let me know if you have a writing routine. Have yourself some seasonal cheer, and if you missed it, check out this Christmas story I wrote for a little holiday entertainment. See you all next year!